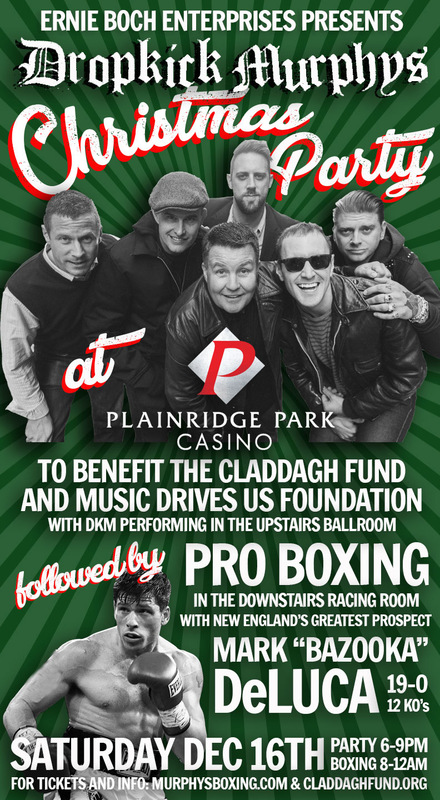 Music Drives us and The Claddagh Fund are proud to present, Dropkick Murphys and Murphys Boxing Christmas celebration, at the Plainridge Park Casino on Saturday, December 16th. Enjoy a rare chance to see the Dropkick Murphys, and Professional Boxing, in a small intimate setting, all while raising money for the Claddagh Fund, the charitable foundation of the Dropkick Murphys as well as Ernie Boch's Music Drives Us Foundation. Dress to impress this December 16th at the party featuring the Dropkick Murphys in the upstairs ballroom playing a casual set of covers, Christmas songs and a few of their crowd favorites , followed by professional boxing in the racing room, featuring New Englands greatest boxing prospect, Mark “Bazooka” DeLuca (19-0), with a stacked undercard that will be announced soon. Deluca comes off an impressive win in his last fight and will be going after win number 20! It is sure to be an explosive main event to finish up the night. The event will kick off at 6:00 P.M., and include appetizers, raffles, Dropkicks final show of 2017 and a full Pro Boxing card. Centrally located in Plainville, Plainridge Park Casino offers a ton of restaurants and gaming options to wrap up the night after the music and boxing concludes. Don’t miss your last chance to see Dropkick Murphys and Murphys Boxing in 2017!!! Ticket options are listed down below.